Gold Cup Slots the excitement of World Cup football. 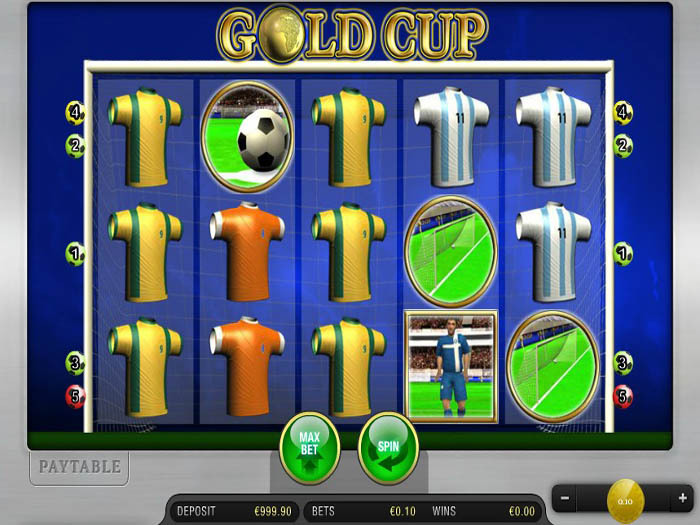 Gold Cup Slots is Merkur’s Gaming gift to all of the football fans out there. This is because the game is themed around their favorite sport, which is football, or as referred to in many places across the globe, soccer. The biggest event in the world when it comes to football is the World cup. The winning team of that event will win the prestigious golden Cup, which is exactly what this game is themed around, which explains the name of the slot, Gold Cup. The game has a format that hosts 5 reels and offers players a total of 5 lines. This is why as soon as players open the game, they will notice that all of the visuals of the slot as well as the symbols that are going to spin on its reels and lines are inspired by the sport of football. This is why the symbols include a goal, the t-shirts of some of the best teams in the world such as Brazil, the Netherlands, Argentina and more. The symbols also include the soccer ball, a soccer players and the golden world cup that all of the team are trying to earn. The game does not only offer players a highly exciting gaming experience, as it is also pretty rewarding. This is because the slot machine has a lot of payouts that it has in store for its players. They will be able to view all of these prizes by simply opening the payouts table of the game. They can do that by clicking on the paytable button that is found under the reels on the left side. The payouts are earned whenever players manage to form a winning combo on any of the game’s lines. A winning combo would have to contain at least 3 matching icons on the same line from the left to the right. The amount of the payouts would also depend on the stake, this is why as players changce their stake, the value of the payouts at the paytable would change accordingly. Speaking of the stakes, players will be able to determine them by going through the single betting option that the game has, which is the coin value. This betting option is found on the bottom right corner of the screen. Players will toggle between the coin values that vary between 0.05 and 5 credits per coin. There is also the max bet option that can place the biggest bet and spin the reels at the same time. Players will then start the game by clicking on the spin button or by choosing a number of fixed spins from the auto play feature options so they can kick back and watch the reels as they spin and as they collect the great prizes. Gold Cup Slots offers 5 reels and 5 paylines with the excitement of World Cup football. Keep an eye out for your favorite teams jerseys and football-themed symbols to help you win big!